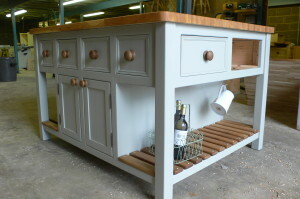 Island units not only make great features in your kitchen but give you loads more storage and worktop space, this unit has lovely deep cupboards running through the middle with plenty of drawers, the ends have been left open with a slatted base-perfect for baskets, and as you can see this island has dowel rods above the slats on which to hang jugs, pans, utensils etc. 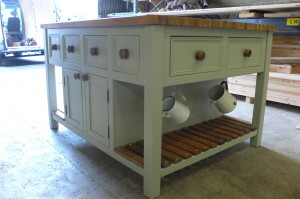 This Parma Grey Island Unit has been painted in farrow and balls ‘parma grey’ with a 27mm pine worktop (this has been stained then coated with layers of waterproof wax so making it durable) and matching knobs on doors and drawers. 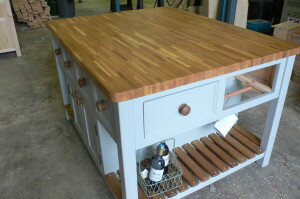 if you wish to upgrade to an oak worktop please add £180.Delivery is free within 250 miles,please note there is some assembly required with this item and this is not included.